Cranberry Sauce for My Dad. Photo by Donna Turner Ruhlman. This is a repost from November 21, 2012 featuring Michael’s Cranberry Sauce and Gravy from scratch. My dad made this cranberry sauce when my daughter was very young. He was mystified, as I recall, having never cooked cranberries before, always used the kind with can-ribs, sliceable. That his granddaughter loved it made it very special to him. He continued to make it. His granddaughter is no longer four but rather seventeen and she will be making it this year (and so did I, because I wanted to share it in this post and think of my dad while it cooked). It’s really simple, can be done today or the day of (or several days ahead, next year). Just throw everything in the pot, bring it to a simmer, and set a timer for 90 minutes. It will thicken up, but you may want to give it another 20 minutes if it’s soupy (you can always add more water, what you cooked out of it, if you find it’s too thick when it’s chilled). Make real cranberry sauce. It goes fabulously well with turkey and everything else. There’s a reason for it; the unique berries grew in America on the East Coast where this whole thing, meaning, um, America, began. Tomorrow the entire country celebrates our singular food-centered gift: this free country and free speech that we must honor and cherish and protect and rejoice in (despite our differences, and they are vast). But tomorrow: Together. As one. A Happy Thanksgiving to all. Combine all ingredients except the Grand Marnier and orange zest in a pot. Simmer on medium-low to low until thick, about an hour and a half, or until you have 2 cups. Taste, and add more sugar if you wish, but it should be somewhat tart. 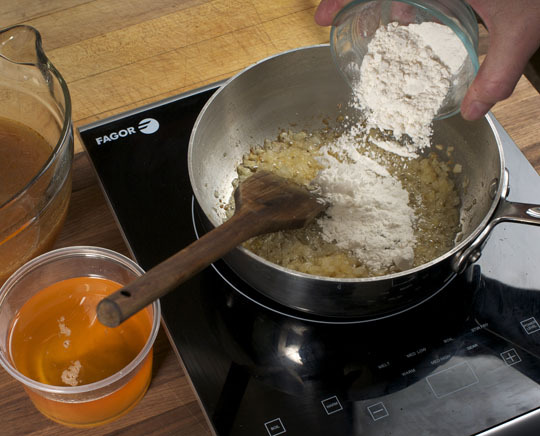 Serve cold or at room temperature, adding the Grand Marnier (if using) and, last, the orange zest before serving. The cranberry sauce is done or it’s not going to happen. 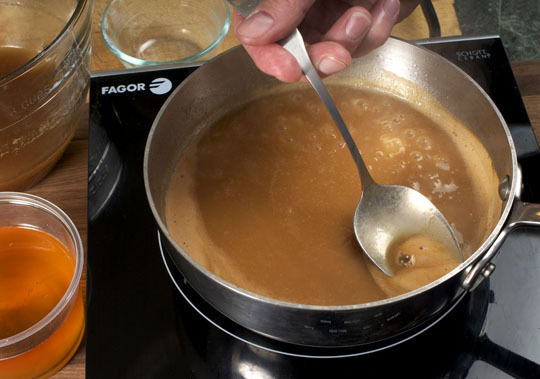 Time to think about gravy, the easiest part of the meal (if you made good stock), and what brings the meal together. People freak out about gravy. I don’t know why. Gravy is easy as pie. Actually, easier than pie. All it is is a delicious, rich stock thickened with flour. In cooking school, they call it velouté, French for velvety. You take a great stock and give it a velvety texture. Flour-thickened sauces got a bad name when bad “French” restaurants served heavy, badly made sauces. 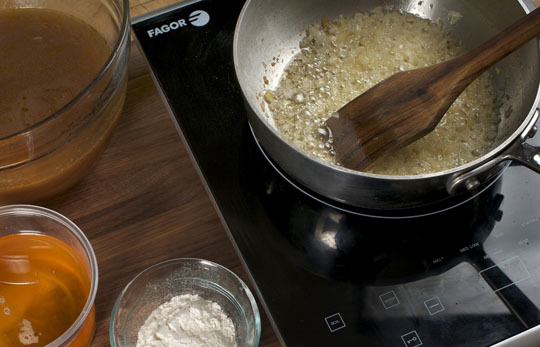 Properly prepared, flour-thickened sauces are light, flavorful, and refreshing. I prefer them to heavy reductions, which, prepared thoughtlessly, are gluey with protein and make the tongue stick to the palate. 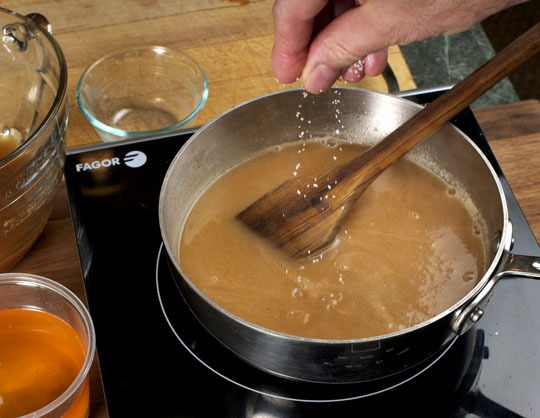 The below gravy is simply minced onion cooked in the rendered chicken fat; flour is added and cooked; stock is added and brought to a simmer as the flour absorbs the liquid and expands in the heat to thicken the sauce. Skimming foam is key for a good for smooth velvety finish (that’s one of our new offset spoons in the last photo, for basting, tasting, and skimming!). Flavor it any way you want. Sage? Chopped giblets? Sautéed mushrooms? Go for it. White wine is always a good idea for acidity and flavor. Season to taste with salt and a few drops of lemon or vinegar. You can make this any time of the day and keep it on a low burner or do it the night before and refrigerate. But the most important thing? Make loads—it’s one of the best parts of the meal and it helps to keep the food hot! Many a dry turkey breast has been saved by delicious gravy. Gravy is nothing more than flour-thickened stock. Photo by Donna Turner Ruhlman. In a medium saucepan, combine the onion and fat over medium heat and cook until the onions are completely tender and just beginning to brown (if you want to brown them, go ahead), 5 or 10 minutes. 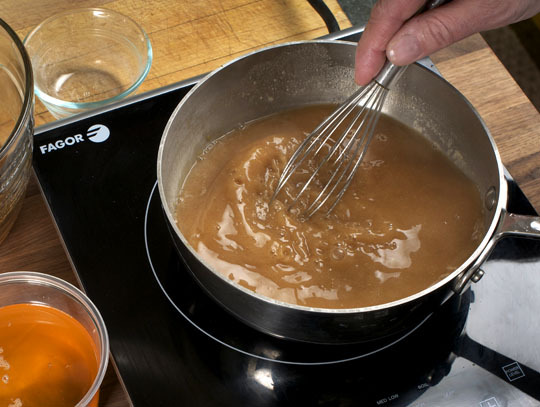 If you want a thin gravy, add 4 tablespoons of flour, for a thicker gravy, add 6 tablespoons. Continue to cook the onions with the flour till the flour lightly browns and loses its raw smell. Turn the burner to high and pour in the stock, whisking continuously as you do. Keep cooking until the gravy comes to a boil and thickens. Season with salt to taste. Skim and discard any foam that collects on the side of the pan. Add a few drops of lemon juice or white wine vinegar. Taste. Does it need more acidity or salt? Add it. Would you like to put pepper in it? Go ahead, it’s your gravy. Fan of giblets? If you roasted the gizzard and heart with the turkey, chop those up and add those. Too thick? Add a little more stock from the cool cooking method I posted on Monday. Too thin? Either make a quick roux of fat and flour and add that or a slurry of cornstarch and water. When it’s perfect, it can keep warm for ages, covered, while you work on the rest of dinner. Serve piping hot. Make your own Turkey stock. Need a quick soup? Try whipping up the butternut squash soup. Use the Roast and Braise technique to cook your turkey. Thinking about sides use my dressing recipe or Stephanie’s pumpkin mac and cheese. Great staple recipes! Great reminder post for all of us! Love your blog. I follow a lot of your methodology for gravy with a couple variations. I make turkey stock ahead ( I am doing gravy for 60 and people show up with about 4-5 cooked turkey). One thing I do is make my roux ahead, in fact I do a nutty reddish brown Cajun style cooked roux. They nutty flavor goes well with all the fall flavors. I sweat some onions and brown them with the turkey neck meat, I prefer this over giblets and I think people really like the little strands of meat from the neck meat in the gravy. I use my 2 gallon stock separator to get the grease off the drippings. I also have to taste test dripping because so many people are brining turkey. You can get way to salty. way to fast. I heat about 3 gallons of drippings and stock, deglaze my onions and neck meat. Once it reaches a boil, I use my room temperature, previously made reddish brown roux to thicken. It’s important to note that when you are making really brown roux, they don’t thicken as much. I also make a little side roux with the Turkey fat to boost the flavor profile. In addition to the lemon juice I like a little fresh chopped parsley and small amounts of fresh thyme. Great gravy covers a multitude of culinary crimes when you are having a lot of people contribute to big Thanksgiving dinners. Don’t leave the gravy to a non foodie. I get a big smile on my face when I see the people pouring a half cup of my gravy over their entire plate. 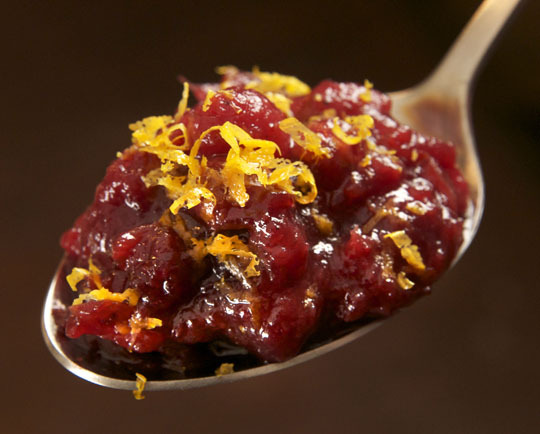 Every year I make my grandmother’s two cranberry recipes: a raw cranberry-orange relish and a spicy cranberry sauce with jalapeno (similar cooking instructions to yours, different ingredients). Might change things up slightly this year, introducing some apple and/or ginger into the relish, but always have to have the raw relish and the spicy sauce, both of which contrast the rest of the meal in interesting ways. Also: One of the few years I’ve been responsible for the turkey I dried the absolute living bejeezus out of it. But my gravy was perfect – I had brought homemade chicken stock with me – so “covering a multitude of sins” was not just and abstract concept that year. 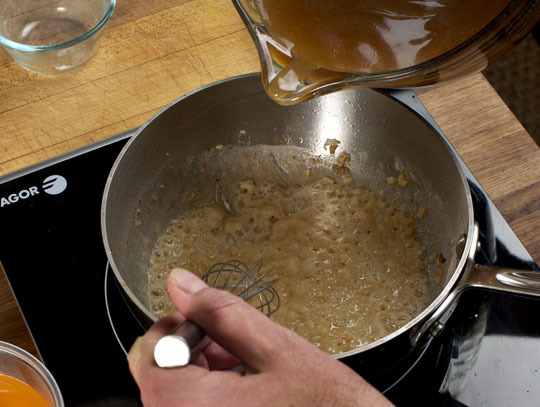 Very similar to Emerils glaze recipe that I use every year on the crispy skin of the turkey. Next to a side of kerplach, cranberry relish and a cast iron skillet of Krugel. Plus some aged eggnog and authentic mincemeat pie. 76k years til next thanksgivikuh, enjoy this one. Re your “1/4 Meyer’s rum”: Is that 1/4 of a 3/4 liter bottle or 1/4 of a 1.5 liter bottle? My family was planning on just doing the canned sauce this year (ick), and I offered to bring homemade cranberry sauce until my mom indicated that it was not necessary. This post has made me reconsider, as this is so easy and so much more enjoyable. That said, I firmly believe that canned cranberry sauce should be present, if only to hear the sound it makes when releasing from the can. unsure if this was Mr.
For your Diabetic readers who love Cranberry Sauce…substitute DiabetiSweet either brown or white for the sugar. It has no aftertaste and is NOT Splenda or Sweet n Low and doesn’t have saccharin. You can find it in pharmacies or online. Used tb to tb as sugar. This ain’t Friday, but it’s a weekender for most. I made Your Fathers Cranberry this afternoon. Delicious! Thanks for excellent recipes for stock, gravy and turkey. Every step made sense and resulted in best tasting thanksgiving dinner yet. Thought I made great stuffing , your recipe improved it.